I haven't had a break from writing yet to think about the next post on food security. It will come, hopefully this week, but in the meantime I thought I would bring you up to date on what's been happening here at home lately. Before I get into that, I have to tell you that I'm not allowing anonymous comments anymore. I don't mind constructive criticism but when I get comments about my hairdo and glasses (from an anonymous "stylist" LOL), well, it made me realise that life's too short to even read anything from people who only want to criticise. I've also had hate comments in the past. Strange that I've never had criticism from anyone who left the link to their own blog or website, hmmmm. I want to share and be a part of my community here and those comments get in the way of that. The lovely Tania over at Ivy's Nest has had a similar problem and all she was doing was writing about her new house cow. There are some very unhappy people out there who want to make others as miserable as they are. I'm sorry it's come to this but getting an ID doesn't take long and it's simple to do. I've kept anonymous comments going for the past six years but now it's time to get an ID if you want to comment here. 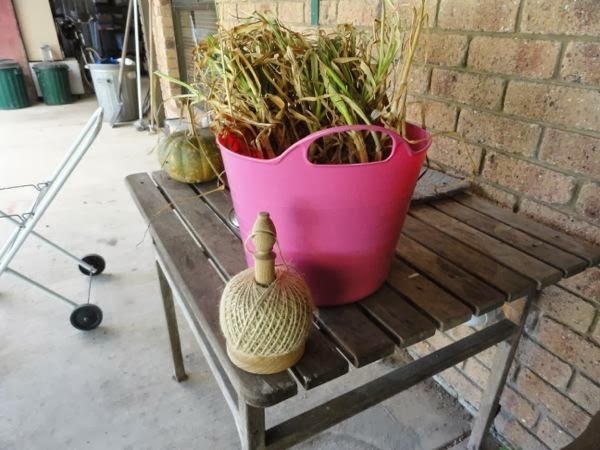 Our garlic just after harvest. 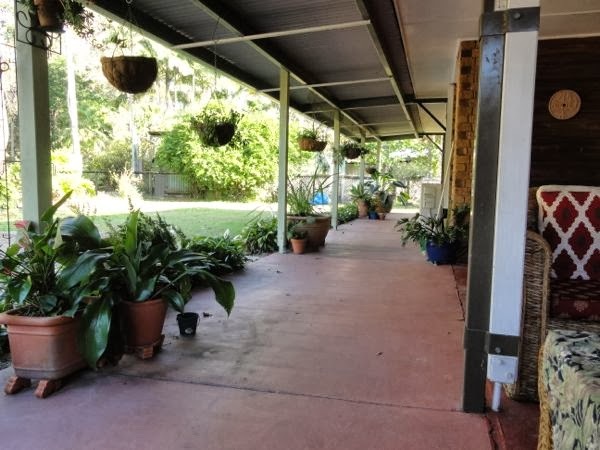 This is the view along the front verandah. We also replaced our seating out on the front verandah and got rid of the very old (antique) cane lounge and chairs. Now we're luxuriating on a new-to-us cane lounge we bought on Gumtree for a fraction of the new price. It's so comfortable out there now I go and sit there as much as I can. It's a great place to read and knit and it's where Hanno and I have our morning tea. Do you have a special place to sit and read? I'm still clicking away on the needles. Right now I'm knitting a Miss Marple scarf in organic cotton, in Diligence, a dark grey, for my friend Kathleen. She is visiting her family in Texas soon and seeing as it's almost winter there, I thought a nice scarf would help keep her warm. This organic cotton is beautifully warm without being scratchy. My other project is for Johnathan, my nephew Danny's little boy. Johnathan turned one last week. Happy birthday Jono! His cardigan is also organic cotton, in Mercy, a pale blue. I just love knitting that EcoYarns cotton. It's my favourite of all the yarns. From the road, the fence going up. 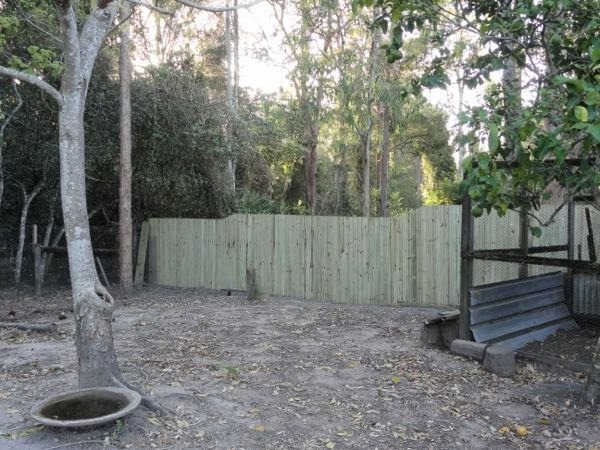 From the house, the finished fence. We had to replace some of our fences lately. 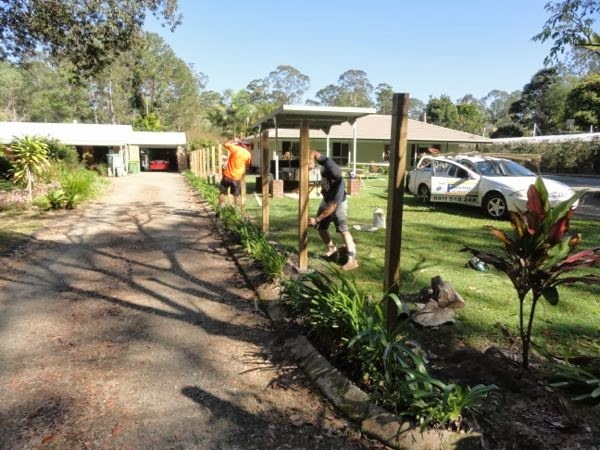 A few weeks ago we had a local company come in and replace the side fence at the front of the house and later, the old chook fence. The front fence had been up for almost 15 years and had become rickety and unsafe. The chook fence had needed replacing for many years. In the past, Hanno would have done that sort of maintenance but it's too much for him now so we got the locals in. Still, it was an expensive exercise and we had to save up till have had enough to have it done. Today we're having family lunch at Daisy's Place, our favourite local restaurant. It is our birthday gift to Sunny to take her, Kerry, her mum Sunja, Jamie and his cousin Jooa to lunch. I love Sunny like a daughter and I'm so thankful she is part of my family. It will be a real pleasure to celebrate her birthday with her mum here. Although we celebrate Sunny's birthday on 8 October, the day she was born, in Korea, it's the custom to celebrate on a different day each year, according to the full moon. They have many beautiful customs in Korea. I've been reading quite a bit about Korea lately, a country with thousands of years of traditions that are so different to our own. I think our garden is nearing the end of its 2013 season. The chickens got in there yesterday and ate about half the new seedlings Hanno planted the day before. We still have a lot growing, and will continue harvesting for a while, but I doubt we'll plant too much more this year. I think it's going to be a long hot summer. So, that's a bit of what's been happening in here. I hope everything is going well for you at home too. I send warm wishes to you. I love multicultural families (and not only because mine is one, either) - so much we can learn from each other, and roots spreading in so many different directions - I don't think many people realise just how much stronger those spread-out roots make them ! I can just imagine you & Hanno having morning tea in your favourite place - I love being curled up in one corner of our sofa, dog by my feet & coffee in hand. I really appreciate all you do for simple living - the vast majority of us love your writing, so hopefully you can forget the silly people out there who probably have nothing better to do than make themselves feel bigger by putting others down. You have been busy! Sorry about the unnecessary comments that have been left. Hi Rhonda. Thank you for another wonderful post - I love reading your blog and am presently halfway through your book. Your veranda looks lovely and so comfortable. I don't blame you for stopping the anonymous option; I've never had it on my blog because it seems like it would be too easy to be pointlessly negative. Dear Rhonda - so sorry to hear you had some critical people comment here. Others will often criticize to make themselves feel on top. You have made a good choice in stopping anonymous comments. Your home looks so welcoming :-) I love your front verandah. It is such a good feeling to get things sorted around the house and as we age we do need a little help ( like with fences ) I am making a bunting to put along the edge of the roof that is over our deck to add some cheer for Summer :-) and yesterday discovered the Asiatic Lilies I planted are up . Sorry to hear about the nasty comments..not sure what motivates some people..
Fun to see what you are up to , with our seasons opposite! I read the bit about the seedlings the chickens ate and then realized it is spring with you! I can't believe someone would ever say an unkind word about you! I love everything about you including that you look a lot like my mother though my mom is aging quickly and is beginning to look a bit older than she used to. Aside from that, I try to be very frugal in all things. Believe it or not, I just moved my family from a very country home to a city home but with a back yard that is quite country. It was so necessary because we would drive to the city every day for work, school, aging parents, our aging selves that in due time getting to drs., etc. is better that we're closer to the city. This home doesn't have a garden but certainly could have one and so we're getting ready to till it up for next spring. My mom and dad still have a large garden (it keeps them busy) and share the bounty with us so I have a lovely full freezer for the winter. One day Rhonda, when everything comes together in the universe, I'm looking forward to having a cool or hot drink with you while sitting on that cane lounge. I look forward to that too, Rose. We'd be very happy to see you here. Oh, Rhonda, I don't comment often but visit here frequently. It is terrible what some feel the need to say and do to make themselves feel better. You handled it with a straightforward manner than one cannot help but respect. Keep on being the amazing person you are and writing these amazing posts! Oh Rhonda, so sorry you have trouble with some of the Meatheads of this world. But you're right, behave or leave, this is your house(sort of ). Thanks for the link to the Miss Marple scarf. I zoomed right over to see if it was named for Ms.Christie's senior sleuth = ) . She is one of our favorite characters and I can just see her sitting, knitting and sorting out the latest mystery. 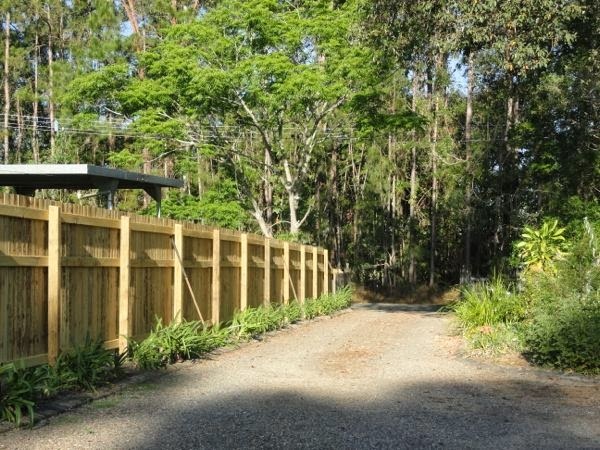 Love your verandah and pics of the new fence. Good morning Rhonda. I can't believe that people can be so rude as to make personal comments about appearance on someone's blog. There just seems to be such a lack of respect in the lives of some people and I just happen to like those glasses! Enjoy your lunch at Daisy's Place. I hope you have a lovely time with Sunny's family. How disappointing that there are superficial, nasty people out there who have nothing better to do than criticise your hair and specs!? They really need to get a life, don't they! If they knew anything about you at all, they'd realise that the 'simple life' isn't tied to how one wears their hair, dresses, what type of spectacles they wear, etc. Just keep on doing what you do best, Rhonda - that is, to encourage and inspire people like me to life a nurturing, productive, and rewarding life, and to tread lightly on the earth, and make it a better place. I've only commented once before, but I read your blog every day, and am so very inspired by you! Keep up all the good work, and thank you for all you do. Negative comments come from negative people. They are only jealous that you have everything that they don't. I for one love coming here to see what you are doing. Keep up the good work. Really? All someone can say is about your hair and glasses? Unbelievable! On one of the blogs that I read there was a typo in the title and someone commented on that, and that alone!! Ridiculous! Having said that, I do love your new seating area, how beautiful that looks! Thanks for sharing your part of the world with us. I had a chuckle at the pesky chickens, for us its our 7 month old labrador 'Magic' who gets himself in a world of strife with my hubby the gardener. I find it amazing that people would leave such comments. You are handling it with grace as always, you are an inspiration to many, don't let the negativity of small minded people dampen your worth. Thanks for another inspiring post Rhonda. I'm from Victoria and I'm fascinated to see your growing season is so different from ours. We love our homegrown garlic and for us the rule is to plant just before the shortest day in June and harvest just before the longest day in December. It beats any garlic you can buy and stores for ages. just a question do you grow your own potatoes and if so do you get many and what potato do you grow and do you get a good yield for each crop. Was just wondering because I never get a good crop and maybe I'm doing something wrong. Personally - I love your veranda - we haven't even a porch - and your 'new' furniture is lovely! Can't wait to hear about garlic - I raised it several times and always failed!?! I love the Miss Marple Scarf pattern, I'd really like to make one for myself. Thank you for the Link. With Christmas approaching I had been giving some thought about Christmas Trees; for the past few years I have purchased a real tree however this is at cost of $40 to $50 AUD per year. I thought what if I grow my own tree in a pot, however I'm concerned about the weight of trying to move the pot inside for the festive season. Another option and cheaper is to buy an artificial tree, this is not really inline with the sustainable values I'm trying to keep. I wondered about recycled plastic trees or what other people have decided to do. I cant believe someone would go to the effort to make nasty comments about someone's appearance on that person's blog. How simple minded. The new fence looks great! I love reading about what others get up to around the house, it always inspires me to get on and do things! My pantry needs a good sort - it's not very big and gets in a jumble really fast, especially now my teenage daughter is starting to cook more, not that I'm complaining ;) People are so silly leaving negative comments about something so trivial as hair and glasses, honestly there are bigger issues in the world and I think you look perfectly lovely! I loved the picture of you in your kitchen in Slow Magazine too. Hi Rhonda, sorry to hear you had some bad comments. People can be cruel. I eagerly await your post on growing garlic. I have never grown it before and would love to. Sometimes the delete key comes in handy; nasty messages wiped in a second. You're quite right Rhonda; anyone with a link generally wouldn't have the guts to be identified. Just a shame it tarnishes the anons that are genuine. 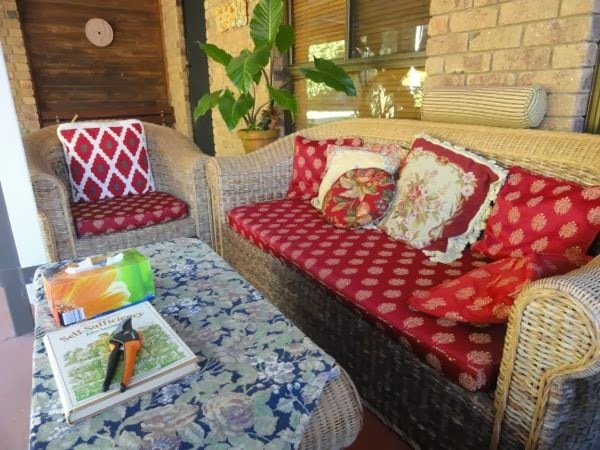 I love the pillows on your verandah sofa; they're a great mix 'n match with the red. Don't soft furnishings add that homely touch. Life at Down To Earth appears pretty busy. Sounds like you're making good progress in reasonable time which for me is always challenging. I can sit for a few days, tapping away at keys; but then jump up like a loony and race to get outstanding jobs done. I really need to find a more balanced approach at doing tasks. 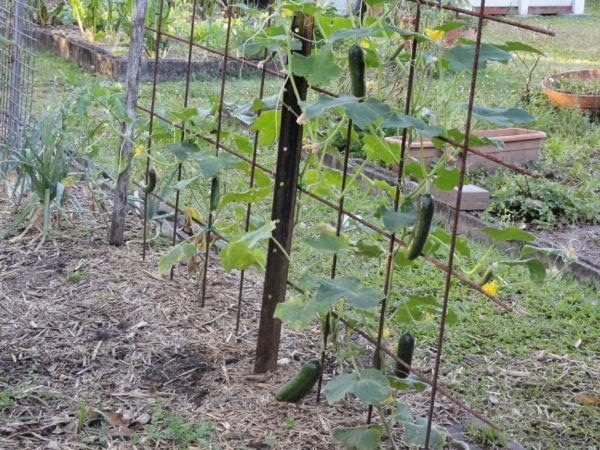 Ooh look at those lovely cucs hanging on the trellis. Reminds me years ago when we pickled them for the first time and everything was wonderful except for the tin lids which turned rusty and spoiled the product. All that effort wasted - painful. Our garlic is the same way - expensive or from China! I must get organized like you and plant my own. Well Rhonda, I am a fan of you as per usual. Anyone who writes silly and nasty comments has nothing better to do and should really look into a hobby or to getting a job..They need to get a life; so remember most of us really enjoy you and value the things you have to say here. I have forwarded your url to many friends who may or may not post; but they all enjoy you and are glad they found your blog. Just wanted to drop in to say hello and that I am so enjoying your blog. You've inspired me to try some new things, and to revisit some not so new things, and I'm having fun! Keep posting, just as you are, and if there are people out there who don't like something, they don't have to read anymore, and they also don't need to spread their meaness. You keep doing what you do and ignore the fools out there. I have never understood the need for people to be nasty. If you do not like what you are reading, leave. If you do not like someone's opinion, there is a proper way to engage in discussion. As for a stylist, women can be the cruelest of all and for some reason, society feeds into the pitting of us against one another. No one wants to live in a bubble of happiness, but I do not come here to read you getting slagged off and I cannot believe someone did such a thing. You have offered so much to so many. No wonder that even design and news sites are starting to disable comments. The petty inciting is ridiculous. Let me just add my (apologetically late) voice to the crowd to remind you that you INSPIRE me in such good and important ways! I am taking baby steps toward the kind of life I most want, and just reading this blog is one of the ways that I feel support w/o pressure to go beyond what I can manage right now. Thanks! LOL Actually Joy, we were showing some visitors around yesterday and I noticed the grass is going brown again. 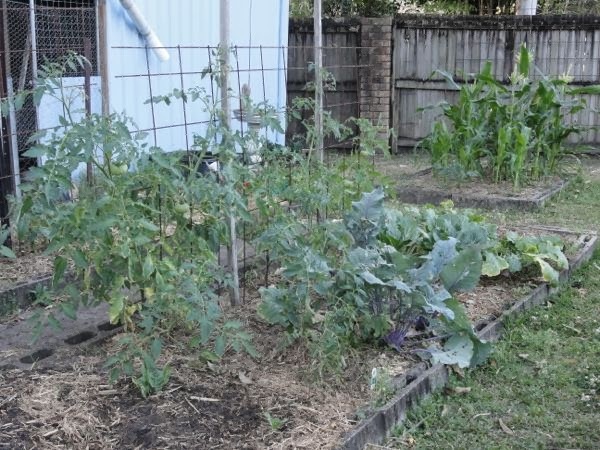 We've let our garden go for the year because we haven't had enough rain. I hope we both get some soon.